It’s not uncommon that clients are overwhelmed by the choices they have and are not sure “what to do next”. We admit there are lots of choices these days and we are proud that we offer the right solutions. We like to make sure that we listen to your concerns and then educate you thoroughly on your options and put those options into an order that would benefit you most. For instance, some clients will hyper-focus on a fine line that is barely noticeable but ignore excess photodamage and pigmentation. Getting rid of a line will not make you look as refreshed as clearing your skin. Promise!! You’ll get more compliments about pigment free skin than you will with improving your mild forehead lines. In summary, we guide you on what is most appropriate and effective at making you look your best. Ever see someone at the gym that only works on their arms and their legs are ignored? Ever see someone who has a clear almost flawless face, especially with all those filters people use, but their chest is a complete mess? So have we. Our goal is to educate you on your best options for refreshment and then after you have a very clear understanding of treatment options, we execute meticulous treatments. There are so many options that it is overwhelming and we recognize that. We encourage you to stay somewhat educated with Momma Google but when it comes to knowing the truth, seek us out. 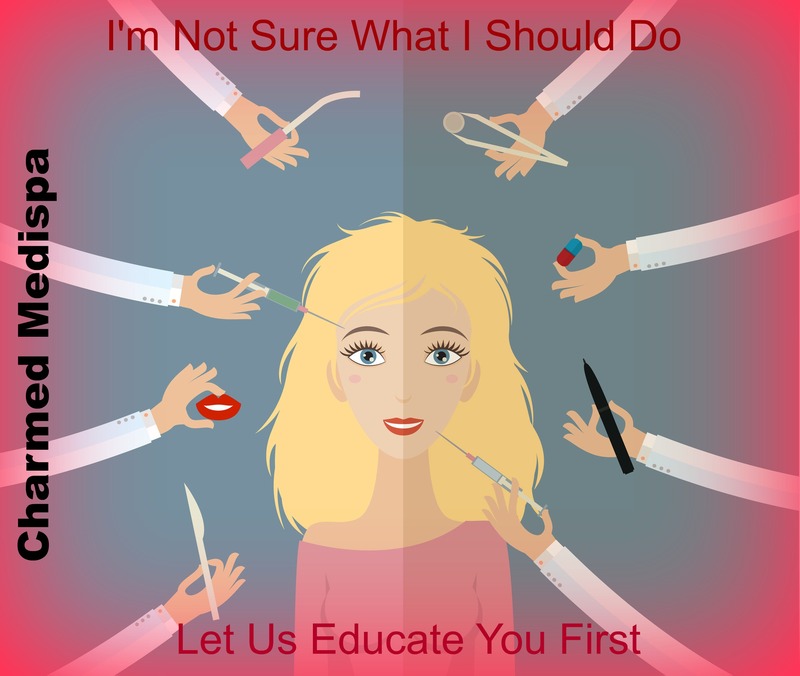 Our goal at Charmed Medispa is to stay informed. We do all the homework so you don’t have to. We are honored to be non-surgical service providers with over 20+ years experience. We offer solutions for acne, problematic skin condition, sagging skin, dull and lackluster skin, photodamage, wrinkles, fine lines, hydration, freckles, redness and irritated skin and so much more. Our products are customized and our treatments are medical grade including lasers and light therapies, Botox, Dysport, dermal fillers, skin tightening, microneedling, facials, microdermabrasions, dermaplaning, chemical peels and more. Give us your concerns and we will weed through what is best for you and explain why. Our office is conveniently located across the street from Christiana Hospital in Newark, Delaware, and close to Philly and Baltimore.